The FIRM at Keystone Heights Airport spans over 420 acres and features tracks and trails for just about every driving style! Race teams fly in from all over the world to experience the dynamic driving venue only The FIRM can provide. Come to discover why The FIRM is considered the most unique motorsports park in North America. Each of our track circuits can be rented individually. Our most popular track rental is our 1.6 mile Full Circuit Race Track. Car and bike clubs like Porsche, Ferrari, SR20 and MiniGP across the region use The FIRM as part of their track rotation. Eibach Springs, Mercedes, BMW and other industry related companies, rent our race track for special events! Race teams like Pelfrey, Junco and Subaru book annually at The FIRM. Our expansive parking areas, picnic areas, space for hundreds of spectators, food truck vendors, and secure location make The FIRM an ideal venue for your special racing event! The FIRM provides one of the most unique motorsport venues because we have so much varied topography. Get tipsy in our 4×4 rock garden or stuck in our marshy, muddy off road trails. Teens can get total vehicle control practice on our lime rock skid pads. We have courses that run across mixed surfaces to perfect weight management transfer and total car control. In fact, the number one cause of fatalities is the weight transfer that occurs when someone goes off road and then over-corrects back on course. We have the perfect course to test your reflexes across varied surfaces and skills that can save lives! The West Loop is the longer of the two halves of our Full Circuit and is the more ‘technical’ side of the track. The West Loop is surprisingly quick and demands full driver concentration. The smooth consistent pavement and uncambered turns are ideal for sorting out brakes and suspensions. The West Loop can be driven with or without ‘the shoebox’. It is ideal for larger solo and time trial events and car and bike club outings or testing. For mixed surface testing and training, the West Loop can be linked with our West Rally Stages. The East Loop is The FIRM’s workhorse solo car and novice driver training track. With plenty of runoff room, it is ideal for quick tests of suspension and brake setups or for use as a Solo event or exotic car driving experience. It is also connected to our .4 mile advanced driving track, which offers advanced multi-surface training options for exciting driver training opportunities. Smooth and flat with generous runoff areas, the East Loop also has a wide grassy shoulder on the outside of one straight and a wide limestone shoulder on the other; ideal for low-traction driver and vehicle testing and control opportunities. The FIRM’s outdoor karting circuit is built to modern standards and is ideal for karting, Solo, Supermoto and drifting events. The drift corners are a little tight though so you better be on your A game! The FIRM’s Rally Stages are at the core of everything we do here at The FIRM. Our reconfigurable, linkable, and reversible stages are like no other low-traction performance driving training facility in the world. The FIRM rally stages are ideal for repetitive practice sessions. You can hone techniques essential to mastering the sport of rally racing. 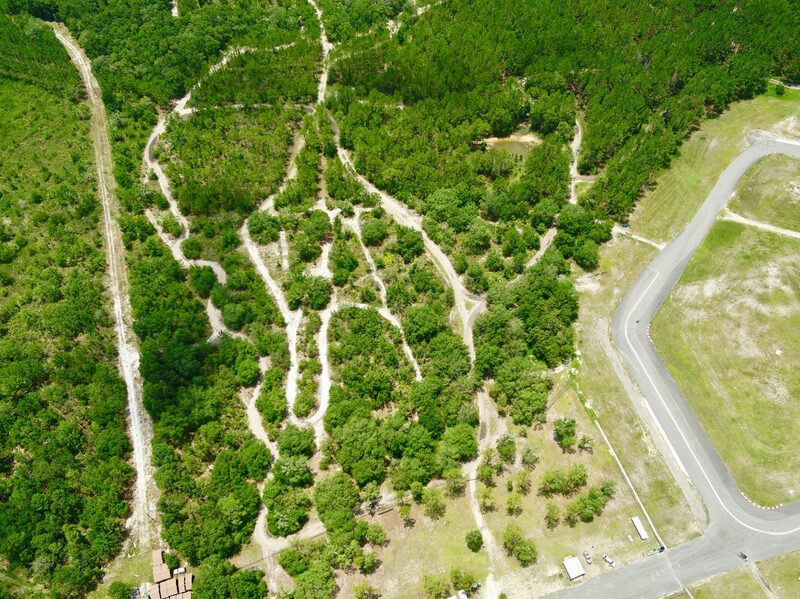 The FIRM’s 1.6 mile race track is one of the most technically challenging tracks in the South. The track has 10 turns, a set of ‘esses’, an optional 4-turn ‘shoebox’ and is connected to our .4 mile advanced driver training circuit. 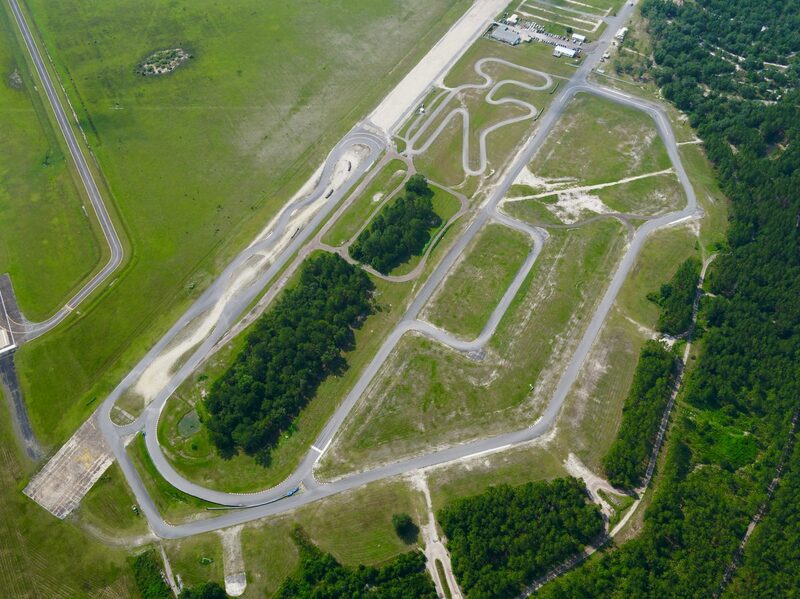 Our race track provides a challenging, highly technical, yet entertaining driving experience. Our track will not just test the performance limits of your vehicle, but it will test you! We also offer open Track Days instruction to improve your skill! Check out our Road Course here. Coming off our main 1,725’ straight away you will swing out wide and brake into the Turn 10 and 1 Complex. There are 2 different lines taken into Turn 10. One, staying out wide left and turning into 10 at a point which lets you maintain a single radius throughout the turn and into the braking zone for Corner 2. Two, the line is staying out to the right down the straight and braking over to the left side of the track to help aid in the weight transfer of the vehicle. To find which line is right for your vehicle, you just have to experiment. When done right, these two corners should become one long single radius turn bringing you into turns 2 and 3. Coming out of Turn 1, you will be driving uphill into a wide entrance, followed by a narrow exit, leading directly into Turn 2 and then immediately turn 3. These turns are deceiving because the wide entrance does not mean a wide exit. The best method for these corners is to brake uphill, and late apex, into turn 2; allowing you to avoid running out of road on the exit and to get on the throttle earlier though turn 3. Turn 4, otherwise known as the kink, is the fastest corner at The FIRM. In some cars, with a high grip to horsepower ratio, you can stay WOT though here. Cars with less grip, or more horsepower, will need to lift or brake just a before this corner. Coming out of Turn 4, you are moving pretty quick. To setup Turn 5 properly move towards the middle of the track. Point the car out to the left side of the track starting around the beginning of the banked corner wall on your right. This will allow you to avoid the off-camber element on the left side of the track. It will also help the car brake and grip better into Turn 5. Be aware, Turn 5 is a little narrow on the exit. Once out of Turn 5, it's a short run to Turn 6; which is a pretty standard corner only needing a touch of brakes. Coming out of Turn 6, and heading towards the hairpin Turn 7, are the esses. There are a handful of ways to go through here. A lot of it depends on how aggressive you want to cut the curbing. If you are willing to cut the curbs you can almost make a straight line through the esses. By far the slowest corner at The FIRM, Turn 7 should be taken wide and patiently. Keep an eye on your apex cone and don’t rush it. The banked corner. Turn 8 is a double apex banked corner. This turn pushes you right up against the turn, so it can be intimidating at first. Once you master your line, it can be a lot of fun. The quickest way though Turn 8 is to brake towards the apex, ride the banking about half to two-thirds up, and maintain a neutral throttle before rotating the car back into the second apex. The exit of Turn 8 is critical, as it will affect your speed, on the longest straight on the road course.